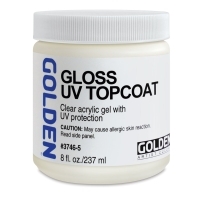 Golden Gel UV Topcoats retain brushstrokes while protecting prints, paper, and other materials from fading. 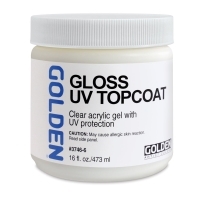 Use these gels to add texture or create a clear barrier prior to working with paint or other materials. 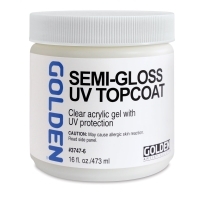 They can also be used to modify sheen and provide a non-removable, water-based topcoat. Whatever you use them for, Golden Gel Topcoats provide the benefit of ultraviolet light filters and stabilizers for protection against fading. In addition, they help lower overall water-sensitivity, limit air exposure, and provide increased durability to artworks. 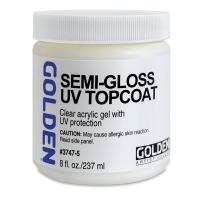 Overall, when used as a final layer, these gels greatly increase the longevity and lightfastness of virtually all digital media. However, if you are exhibiting your pieces without glass, the manufacturer strongly recommends application of a removable varnish in addition to the Gel Topcoat in order to facilitate cleaning and future conservation. 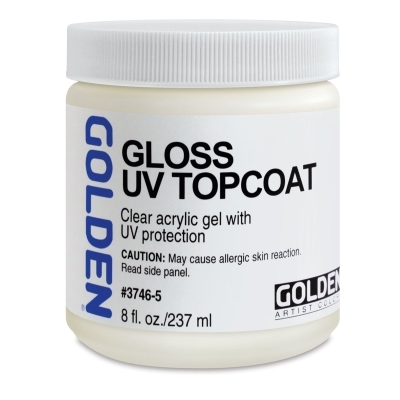 Golden Gel Topcoats are fully compatible with other Golden gels, mediums, and acrylic colors, and can be used to create gel skins, image gel transfers, decoupage collage elements, extend paints or increase their transparency, create a wet layer to work into, or simply as a clear ground to work on top of. A new and exciting acrylic medium that allows for digital printing on any surface that is thin enough to run through a printer. This demonstration shows how it's done.